Hi! This is Jono’s wife here. I usually blog at makey-cakey and generally make things that have more than 4 ingredients, however whilst I was cooking Sunday dinner I realised two things: firstly, it tasted awesome and secondly, it only had four ingredients. It seemed only fair that I should write a guest post about it. This is super easy - a slow cook that allows all the flavours to develop and it was delicious paired with some fluffy mash. 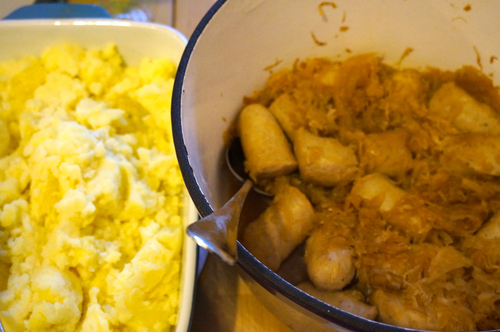 Halve the onions and slice thinly, and cut the sausages into thirds. Brown the onions and sausages in a large casserole dish or deep frying pan over a low heat for about 10 minutes. Add the sauerkraut and beer and continue to simmer gently, stirring occasionally, for about 3hrs. Top up with a little water every now and then to stop it sticking and drying out.